And back we go into the climate change special issue. This isn’t really an article as such. It’s just a collection of infographics or whatever on how water temperature, crop yields, surface temperature, weather, and our health are projected to change over the next decades. Melting Away is about the changing cultures of the indigenous people of Greenland. Pretty much all of the agriculture in Greenland takes place in the south, so the thousands of people who live along the coasts stretching northwards still rely on hunting for their livelihoods. As the ice shrinks, the migration patterns of their food animals is changing and making it more difficult to maintain their lifestyle. Younger people are moving to the cities (for reference, Nuuk, the largest city in Greenland, has about half the population of the suburb that I grew up in), which means that the older way of life in the more central and northern areas of Greenland may be dying out. 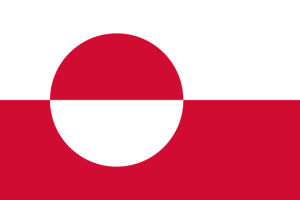 As an aside, Greenland’s flag is awesome. It may be my favorite flag ever. It’s simple and yet the off-center circle adds interest. The flag of Greenland. Public Domain image created by Jeffrey Connell. Two more articles to go, which I will probably post on or around March 20, and then on to September 2013.